Karli Foster, Cameron Brummitt and Ryan Byrd look over an assignment during their summer internship at The Harvest Foundation. Summer internships may mean job shadowing in some organizations, but not The Harvest Foundation. Three local students found that out this summer as they rolled up their sleeves to help Harvest move to its new offices. They drew on their computer skills to move grant files from papers to computers. They learned that their opinions mattered when the Harvest staff sought their input during discussions of community issues. And they realized that, at least for now, they want to move back here someday because, as intern Karli Foster put it, they know how hard people are working to improve the area. “We know the community will be better than when we left,” she said. Foster, Cameron Brummitt and Ryan Byrd were interns at The Harvest Foundation this summer. Foster graduated from Bassett High School this spring and will attend Virginia Tech this fall. Brummitt is a 2016 Magna Vista High School graduate who attends the University of Virginia. Byrd graduated from Bassett High School in 2016 and Patrick Henry Community College in 2017, and he attends Virginia Tech. 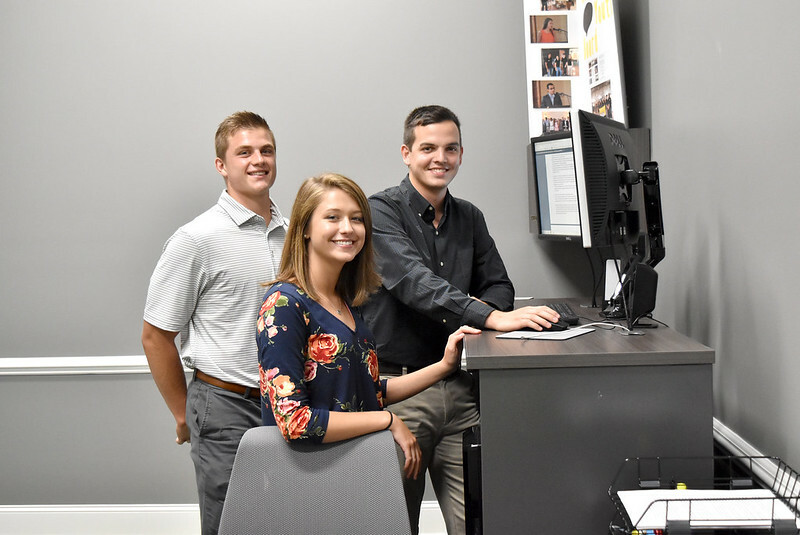 This summer, they spent much of their 20-hour-a-week internships helping the foundation move to its new offices in the former SunTrust building in Uptown Martinsville. They packed boxes, organized materials, helped move furniture and more. The interns also helped the foundation move its files into a new grants management system. Harvest President Allyson Rothrock called that task “monumental” because each grant can involve dozens of sheets of paper and, according to its 2017 annual report, the foundation awarded more than 250 grants in its first 15 years. Brummitt and Byrd scanned the paper documents and Foster added them in the new system as Harvest moves into a paperless world. “When we started they didn’t expect us to get half done” by the summer’s end, Foster said. But they finished by late July, even with Byrd and Brummitt learning Foster’s role so the work didn’t stop when she went on vacation. “We were told flexibility was important in this internship, and that was true,” Foster said. But the interns’ influence and the knowledge they gained went much further than moving furniture and files. “Most internships are job shadows. We were treated as equal here. We were asked for our opinions, not just told” what to think or do, Foster said. “They valued our opinion,” Byrd said, adding that the interns attended a Harvest board meeting and several program team meetings. “They encouraged us to speak,” and not just on matters of interest to young people. “We talked about grants proposed to them. We would also partially get a vote” and could make suggestions to Rothrock, he said. Brummitt agreed. “We had more of a voice in what was going on instead of just listening,” he said. That differed from other internships and jobs he has had in the past, and it led to more chances for collaboration with others, Brummitt said. Learning to collaborate was one of his goals for the Harvest internship, he added. “I wanted to learn a new skill set that I may not have been exposed to prior to this” and how to talk and work professionally with others, he said. There also was a positive environment — “a smile every day” — at the foundation, Brummitt said. “They genuinely cared” about the interns, and asked about their plans, he added. “I enjoyed feeling like I had a purpose in the internship because of how much Harvest invests in the community,” Byrd said. He added that is evident in its new offices, the grants it awards and its investment in the social aspects of the community, such as the Smith River Fest on Aug. 11 where Harvest Communications Director Latala Hodges spent the day. Byrd is pursuing a career in the data analytics field. His mother saw a Harvest announcement of summer internships on Facebook and “it was exactly what I was looking for,” he said. “With Harvest it was more enticing because of what it does for the community,” and he is aligned with its vision and values. “I learned how to act professionally in an office environment. That will help me in the future to transition to the business field. It helped teach me things I didn’t learn in school — how to communicate and work together to achieve one goal,” he said, adding that he also got more hands-on experience at the foundation. Foster interned at Harvest during her senior year in high school as part of the O’Henry Internship Program, and both she and Brummitt served on Harvest Youth Board. Foster was its chairman last year. Her favorite part of the summer internship was “being part of something big for the community. This move (of Harvest offices) is big for Harvest but bigger for the community. It’s exciting to be around,” she said. Both Foster and Byrd said the internships helped them value the community and realize how many people are working to improve it. All three interns said they hope to return here someday if jobs are available. As long as the Harvest Foundation board approves funding, the organization will have interns, according to Rothrock. “They bring a breath of fresh air into the foundation,” she said. They sat in on meetings of the staff, board and board committees, and they were asked for suggestions and recommendations at each session, she added. DeWitt House, senior program officer at Harvest who has than 30 years of experience as an educator, agreed that internships are valuable for the students and Harvest. “I think it was invaluable to have a different perspective at the table. The interns participated in every aspect of our operations and were able to articulate different viewpoints. I think the experience is great for them, but just as valuable to us. They bring a certain level of energy, enthusiasm and creativity that is infectious,” he said. At the beginning of each year, Rothrock and the Harvest staff meet to discuss future projects that interns could help with and decide the focus of the internships. That is included in a detailed job description that is circulated through social media and to area high school principals by spring break, Rothrock said. This year, there were 13 applications for internships. Harvest had planned to hire two interns, but the staff was so impressed with Foster, Byrd and Brummitt that all involved agreed to hire three who would work fewer hours and days a week. When recruiting interns, Harvest looks for high school graduates who are interested in the community and want to give back to it. They also should be interested in Harvest’s work and goals, Rothrock said. At a recent farewell luncheon for the interns, Rothrock told them she was sorry to see them leave but eager to see their success in the future. “I’m always on my soapbox with them because I want them to be successful,” she said later. She also recently asked them to consider what they had done for someone else that month. She didn’t expect an answer then but told them she will ask the same question each time she sees them. A few days later, Brummitt told her he had his answer. He said he was leaving the next day for the Dominion Republic where he was going to coach unprivileged, underserved young men at a baseball camp. “He’s going to make a difference in those young people’s lives,” Rothrock said.